I think my old DM and the new DM are both being mean to me now. I don't know what to do, but I really don't want to go to our group meeting tomorrow. Well things worked out pretty well. It turns out they were only being mean to me because they misunderstood my emails and once I apologized enough their feelings were mollified. I sent another message with a question about attribute rolling and now I'm "trying to turn the group agains the DM" apparently. I'm so tired of the two older players being suspicious of me and taking offense at the things I say that I've decided to simply not communicate with them at all outside of our actual meetings. If I have questions or complaints or criticisms or suggestions or ideas or anything about the game itself I'll just keep them to myself. D&D players are a bunch of curmudgeonly wankers with a penchant for being big-headed cobbler-snorters. Or at least the ones who have been around long enough seem to be. Well speaking as as a DM who has been around long enough- thats probably true! I started reading it last month but then I got.. erm.. distracted! Anyway, did that group of yours ever get started up Petty? We made a new set of characters and switched over from the pre-generated WotC campaign to a homebrew world. It's a lot more fun so far, and I've been having a better time of it. I'm playing a dwarf fighter, it's pretty fun. Last session we tracked a missing caravan to a swamp and fought a green hag. She actually took my character down, but thankfully he survived due to some quick thinking from another player. Well at least you started it!! (I am going to have to rewrite the prologue I feel- its style seems a stumbling block for some and its a -deliberately- different style than the rest of the story- but that seems not be working). But heartened to hear you are having more fun with the game now- I will always champion homebrew games over prebought ones any day of the week. Sadly no, our group never got off the ground as one person was pushing for everything being done their way to the point where it alienated and/or annoyed everyone else. Perhaps one could... skip the prologue? That's too bad about the group launch failure. Like I said before, D&D players are just difficult to get along with! Its rather crucial to understanding the plot. On the plus side its not very long. On the downside I'm already behind on more than a couple of your creative writings Petty! On another note, I quit my D&D group last Monday. We had met the day before and during that session I had talked about what kind of game I wanted to be playing and brought up a checklist I had found online that I thought would encourage discussion: https://bankuei.wordpress.com/2010/03/27/the-same-page-tool/ I don't think anyone really got what I was talking about, or else they just didn't want to talk about it. It didn't really go that well. We didn't actually address anything, and then I had the same problem of being frustrated with most of the game. So I quit. I sent everyone a polite message about it. Noone's actually responded to said message. They're probably just busy or something, but it's been 3 days and being reminded of the sort of nervous "Did I do something wrong? Why doesn't anyone respond to my messages or posts?" feeling that I used to get sometimes makes me feel tons better about leaving the stupid group. None of them were my friends nor would have been with more time, just acquaintances who tolerated me or something. I felt sad and, because the group has been one of the things that distracted me through all the anxiety I had last December, nervous about what I will do in the future. 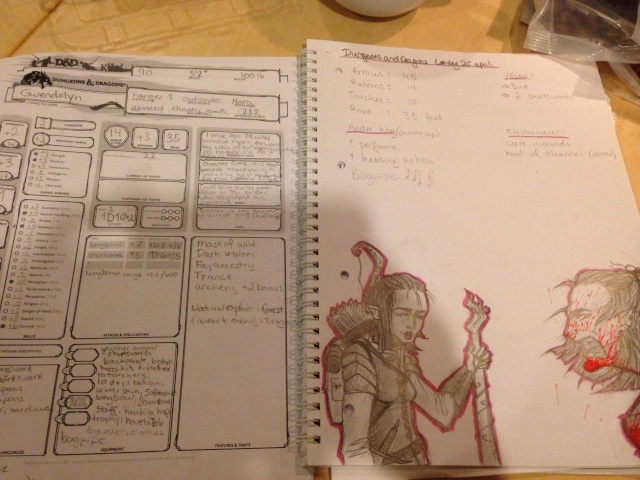 I still want to try and get more friends, and playing D&D can be such a fun way to spend an evening. Thats a shame you didnt find a group you felt comfortable in Forest- but dont give up! As to my creatve readings, if you only have time for one I'd pick the Dark Planet Day Stroy, as its about the Forum and a lot fun (I hope!). Petty's Dark Planet Day fic is one of the highlights of the Creative Corner. "Home" is also excellent, though it's not a "fun" story. Eldorion wrote: Petty's Dark Planet Day fic is one of the highlights of the Creative Corner. "Home" is also excellent, though it's not a "fun" story. To the Underdark with it then! No luck finding a group still! I am reeeaally close to trying to convince my sister to let me DM for my niece (13) and nephews (7 and 8 ). That's an uphill battle coming and going though, so I don't see that working out. Those are tricky age groups to DM for- there is a fair amount of difference in interests and what will engage between 6 and 13. Id imagine the rules would also seem overly complex and boring too at 7/8. Would have to me anyway. Playing D&D now.. Any tips? Norc good to see you (you still have a chance to vote in the awards you know!) as to playing D&D, always remember that the players an the DM are not on opposite sides. Too many players mistakenly view the DM as if they are another player that they have to beat- if they are a half decent DM that should never be the case- they just provide the world and monitor the rules. Gameplay wise- know your characters skills well, and when you have to prepare them (especially if you use spells as often they have to prepared in some fashion before use) dont get caught out trying to remember what your skills or magic are at the last minute and wasting rounds whilst some horror tries to bite your face off! Where have you been Norc! Petty has great points of course, but Halfy is kind of right too. In my last group I would sometimes bake pies and bring them. Never hurts. good points... although since none of us had ever played it before we did spend the time badly... whoops.. we almost got killed by some goddamn wolves, had to camp right outside the goblin-tunnel, ruined a tent... but yeah, things are going well my character is awesome i am good at long distances at least..
what we've learned... don't try to reason with wolves and throw the rabbits at them first thing!! and if in doubt, kill it! wood elf, ranger long bow(+7) and 2 shortswords(+5), explorer kit, armour class 14, 11 hitpoints.. +6 survival.. eerr.. i can't remember more but she's awesome. If boyfriends are even HALF the time wasters girlfriends are then I suppose we should get used to not seeing much of you. Earlyish in the morning: You wake up, stretch, express excitement and satisfaction to yourself that you have a whole day ahead of you to actually get stuff accomplished for a change. Slightly laterish in the morning: HE shows up. Suddenly your plans look less certain. Lunch time: He's still there. You've done nothing and are beginning to feel uneasy. but hey, it's lunch time. No reason you can't devote time to lunch. Post lunch time: Still there. You've thought about voicing concern about your master plan of the morning, but he's just so beguiling, surely you can throw another couple hours to the wind. I mean, he is your boyfriend after all. Dinner approaching: Well, you're not gonna accomplish anything before dinner anyway, and you've had some important conversations and even taught him how to double knot his shoes so they don't come undone. Incredible that he's made it this far in life without learning such a basic trick. That's worth wasting a day of work for, isn't it? Dinner: well, you had lunch together, may as well bookend the visit. After dinner, by an hour or so: He suddenly realizes he has things to do, so exits. You are pleasantly drunk by this time, so just spend time goofing off on the computer. That's it, that's what boyfriends are for. You know they're supposedly an important component of life, but somehow they don't seem to move said life forward in any significant way. The main thing they get you is now you can nod your head in satisfaction and tell yourself "I have a boyfriend". Fun and all that, but not like conquering Spain. Seems like a fine projection of the role a boyfriend fulfills in one's life. But then, I've never had one before so I cannot speak from personal experience. That's great you're enjoying D&D Norc! It sounds like you're playing the Lost Mines of Phandelever pre-written campaign. I never tried it myself as my group jumped right in with The Hoard of the Dragon Queen before moving on to a homebrew world. Anyway, I'm jealous. Happy hunting!